Listening to the new CD by the Maguire twins is like hearing a good book. After one listening, you find yourself hooked and can't wait for the next chapters to unfold. It has many moods and transports you to many places. The twins have quite a few magical moments throughout this CD. Donald Brown, The renowned pianist helped the two blossom into a drum and bass team that is almost telepathic. « Seeking Higher Ground » est l’aboutissement de ce que les Maguire Twins ont hérité des géants du jazz de Memphis et du reste de l’Amérique et du développement de leur propre son. With the kind of post-bop material that’s easy to listen to but hard to play, these twins have now officially joined the ranks of such historical jazz brother teams with names like Heath, Brecker, Marsalis, Farmer, Montgomery and Mangione. Welcome to the club, boys. The new project is another strong display of skill and innovation. It is truly a straight ahead jazz jewel that will be a very entertaining Feature CD. When distilled into music, especially jazz, and more especially by this stereo innovation called Carl and Alan Maguire... it really is grace, and it brings with it both honor and welcome, and passion, and forward thinking -- and so much more! These are two very old souls. I sense their youthful sparkle, rich musicality, solid techniques and their broad flexibility towards music all over in these twelve heavy duty tracks. I feel that music is not merely a sound, it mirrors the player’s energy, emotion, personality and literary understanding. It is exciting to see how Carl and Alan will develop as musicians in the future. All the very best to their journey. Carl and Alan's sophomore recording "Seeking Higher Ground" is a wonderful showcase of their continual growth as musicians. This was an enjoyable documentation to be a part of, and it forecasts the bright futures they have ahead of them. It's just AWESOME ! Perfect quality, inspired music & solos ! Compositions are great ! Jazz is about being true to yourself when you play, and that's how I felt about Carl and Alan after our first performance in Hong Kong. I was inspired by their passions for jazz at such early age. This wonderful album with great tunes beautifully produced by their mentor the great Donald Brown, truly shows off their committed role as the rhythm section. I'm thrilled for their accomplishments and looking forward to what lies ahead for them as they journey through the world of jazz. This is a treat for all those jazz aficionados who find themselves seeking proof of the foundation of the future of jazz. This music is sure to be considered a continuation of the tradition of jazz that still prospers, thrives, and grows stronger in the hands of this new generation of jazz artists. This album is fantastic! 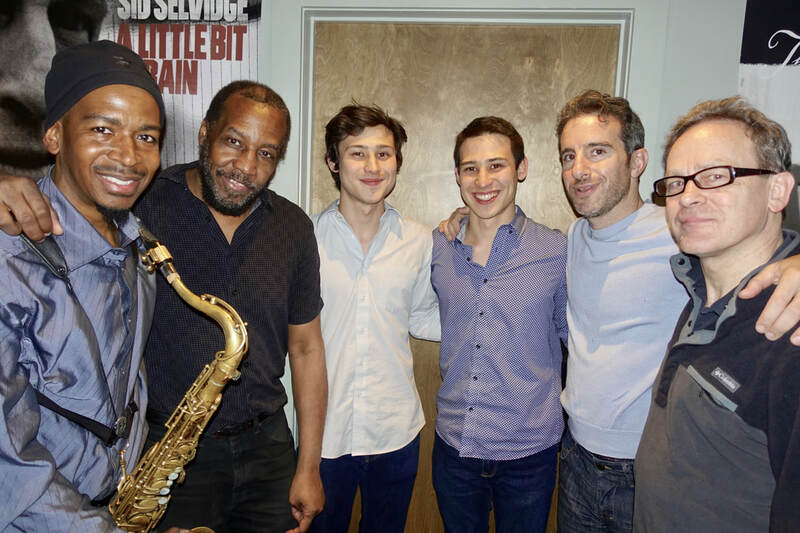 I can feel that Carl & Alan, two young artists full of talent, are evolving further with strong musicians such as Gregory Tardy, Aaron Goldberg and Bill Mobley. 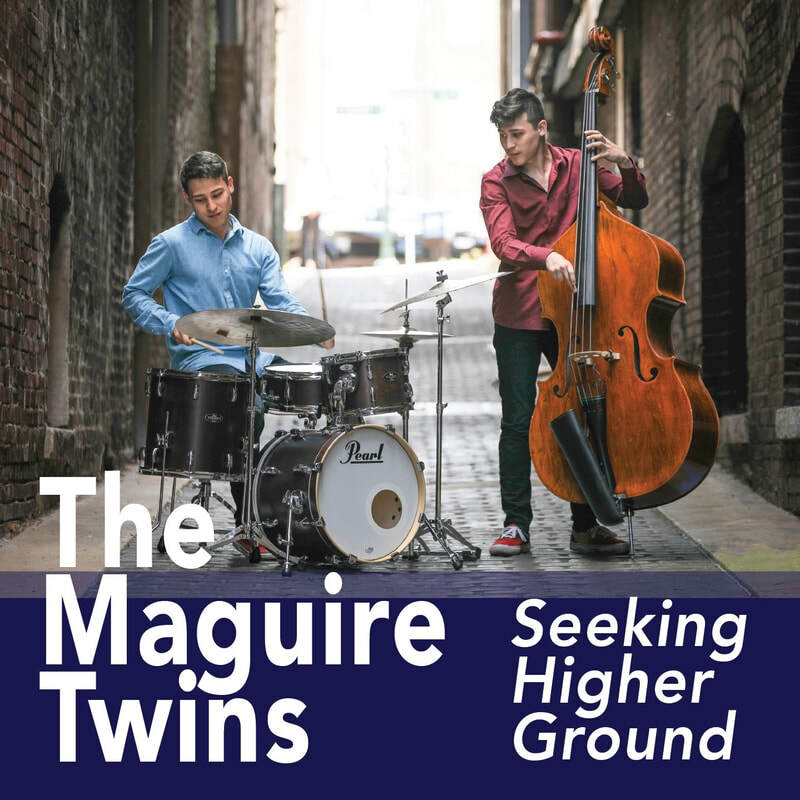 ‘Seeking Higher Ground’ is the culmination of what The Maguire Twins inherited from the jazz giants of Memphis and the rest of America and for the development of their own sound. Carl Seitaro Maguire & Alan Shutaro Maguire, now 21-year-old identical twins, were born in Tokyo and grew up in Hong Kong going to a British international school. By age 14, they knew they wanted to make music the center of their lives. Their performances in Japan and Hong Kong in the winter of 2013-2014 were unexpectedly popular and caught the attention of many local media outlets. Ever since, they have been touring Japan and Hong Kong annually where their fanbase continues to grow and expand to farther reaches of the world. They have performed with artists such as Yosuke Onuma (g), Shigeharu Mukai (tb), Yuichi Inoue (p), Yosuke Sato (s) in Japan as well as Ted Lo (p) in Hong Kong. The Maguire Twins have accomplished much in a short time. The twin brothers, just 22, are already world class jazz musicians who hold their own on stage and in the recording studios with top all-stars, offering tasteful and stimulating accompaniment along with occasional solos of their own. Born in Tokyo and raised in Hong Kong, Alan Maguire remembers, “Our older brother is the reason that we began playing music. He played guitar and wanted to create a band so I started playing bass and Carl became a drummer. We had a rock band for a short time.” Although their brother soon stopped playing music, the bug had bitten Alan and Carl and they dedicated themselves to music. In 2014, Carl and Alan released their first CD, “The Sound Of Music”, utilizing both Brown and Whalum. “We recorded the entire album in one 12-hour session,” says Carl. “We recorded 9 songs and did not know that normally it should take two or three days!” Since then, the Maguires have performed various venues in the United States including Knoxville Jazz Festival and have toured Japan and Hong Kong. For Seeking Higher Ground, Carl and Alan Maguire are joined by tenor-saxophonist Gregory Tardy, veteran trumpeter Bill Mobley, and pianist Aaron Goldberg, with Donald Brown (who appears on one selection) producing the project. Alan says, “We listened to pianist Aaron Goldberg when we first started playing jazz and his song “Shed” was the first song that we learned from musicians of his generation. When Donald said that he had gotten him for the date, we were just amazed.” The quintet performs two songs by each of the brothers and Donald Brown, one apiece from Tardy, Goldberg, Mobley, Geoffrey Keezer and Jon Hamar, and a fresh version of a standard. The set begins with Tardy’s “Theodicy.” The two horns give the music a classic hard bop sound but the complex chord changes, the passionate tenor, trumpet and piano solos, and the assertive drumming of Carl make it clear that this is 21st century jazz. Goldberg’s patterns on the piano set the mood and groove for Keezer’s “Hibiscus.” Alan’s bass lines are a particularly attractive part of this piece which also has fine soprano playing by Tardy and one of many excellent trumpet solos. “The Early Bird Gets The Short End Of The Stick” was composed by Donald Brown before he came to New York and joined Art Blakey’s Jazz Messengers. This hard-driving piece inspires several inventive solos particularly from the explorative Tardy. The somber ballad “Clarity” was composed by Alan’s bass teacher Jon Hamar. It features brief statements that perfectly fit the melancholy mood. Since Aaron Goldberg’s “Shed,” which has a particularly catchy pattern in 5/4 time, was such an important part of Carl and Alan Maguire’s early development, it was a thrill for the brothers to record the song with the composer himself. Listen to how closely and effortlessly Alan and Carl Maguire work with each other. Alan’s “Song For Arjun,” written in memory of a friend from Hong Kong who died at age 19, is a celebration of life that has a dramatic melody, powerful solo statements, and strong accompaniment by the Maguire Twins. The bassist’s other piece, the mostly out-of-tempo “Witch,” is more avant-garde and utilizes colorful harmonies. A contrast is offered in Mobley’s “49th Street,” a swinging romp through the chord changes of “Lover.” Carl’s “Midair,” which is based on Joe Henderson’s “Inner Urge,” has numerous colorful drum breaks along with fiery solos. The drummer’s “Machi No Michi” pays tribute to the Maguires’ heritage with an Asian tinge to the melody, a Japanese scale in the bassline, and the feel of taiko drums throughout. Donald Brown’s “An Island, A Piano, And Keith,” is an upbeat number originally written for his son pianist Keith Brown. This rewarding CD concludes with Alan’s arrangement of “Someday My Prince Will Come” which greatly modernizes the song, uses a completely different chord progression, and inspires some particularly strong improvising. Seeking Higher Ground covers a wide area of music from bebop to the avant-garde. It is a major step forward for Carl and Alan Maguire, two young musicians whose potential is being realized.